Managing your staff’s well-being is an important element of talent management, says Jacqui Barratt, director of font talent. The 40-hour week is a bit of a myth in Asia. According to the Hong Kong Human Capital Survey referenced in this article, one in five people in Hong Kong work around 61 hours per week, and employees in Singapore clock in the second-longest working hours in the world. When you add a couple of hours’ sleep, grocery shopping, commuting and maybe a gym class to the mix, it doesn’t leave a lot of time for much else – like friends, family and generally indulging in hobbies. But plenty of studies point to work-life balance, and its knock-on happiness effects, as being vital ingredient to producing enthusiastic, successful, productive and loyal employees. Managing your staff’s well-being is an important element of talent management. So how can you make sure your team achieves a little more balance by walking out of the office at a decent hour, whilst still performing? Here are some tips that can help both you and your staff leave the office on time. It can be very difficult to achieve anywhere close to a 40-hour week in Hong Kong. If you’re in a global company or you have globally-scattered clients, your firm will often serve as the hub connecting the Pacific, European and American time zones. You might find your team roped into conference calls any time from 10pm to 5am – eating into your precious sleep, family and “switch off” time. If that’s your role, there’s not a lot you can do about those conference calls, but you can have a chat with your team about juggling these responsibilities at home. Whilst there’s an argument for keeping your work and home lives separate, you are still missing out on precious moments of “you” time when you’re sitting under the office halogen lights in the same position at your desk until midnight every night. It’s probably more productive to switch off for an hour or so, have some dinner, and then take your call from the comfort of home. A good Internet connection, laptop and mobile phone is a must in order to succeed, so if you company doesn’t provide these already, make sure you start putting measures in place to help both you and your team work from home after hours. Leaving the office without a guilty conscience is possible if you master the art of lists and calendars. Keep an up-to-date calendar of meetings and appointments so you can see at a glance what you need to fit your work around. Just because your meeting took up two hours of your day, it shouldn’t mean you work two hours longer. Work smart, and prioritise your tasks around those set meetings. Before you leave at the end of the day, take a second to write a to-do list of things you absolutely want to achieve the next day. Before opening your email in the morning, bring up that list when scanning your inbox so that you are already thinking in terms of what is important for the day, and what is not so important. Many people stop delegating because they find themselves redoing their colleague’s work. Instead, set aside 10 minutes to half an hour to really explain what you are looking for and help your colleague to complete tasks to a standard, and in a manner that will not require so much of your time reworking. No, it will not render your role redundant, it will instead allow you to focus on tasks you really should be doing – those that make best use of your expertise and talent. If there’s someone who tends to corner you at the coffee machine to tell you about her latest Tinder dates and eat up 20 minutes of your precious time, try to get your coffee just after her, or tell her you’re in the middle of important work. Similarly if you and your colleagues use instant messaging at work, let others know when you are available to take questions and when they should hold off on anything non-urgent. Lunch breaks are precious when you are working long hours, and it’s definitely true that stepping out of the office to clear your head will make you more productive. 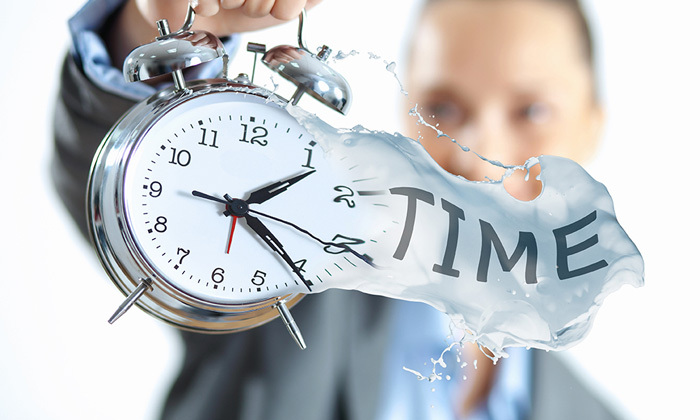 However, if you try to keep those breaks to just half an hour, rather than the full hour, you will be able to knock out a bunch of pressing tasks and then leave half an hour earlier. Meetings are key to keeping everyone on the same page, realigning objectives and keeping a project moving forward. But too often, with so many people roped into meetings, they can be a real waste of time for a lot of people in the room. The best rule of meetings is to keep them to half an hour. You’re probably remembering that three hour marathon you had this morning and thinking, “yeah, not possible”. But successful business people like Steve Jobs have been practicing the art of the 30-minute meeting and encouraging others to do the same. Firstly, find out whether you need to attend the meeting at all. In the marketing industry, for instance, too often agencies rope everyone in to conversations that really only need the account manager and the client. Then circulate an agenda for the meeting and keep it realistic, with priority issues addressed right at the beginning. Whoever is chairing the meeting should keep the conversation on topic, encourage quick decision-making and someone should also take brief notes of action points to be circulated immediately afterwards. You may not be able to avoid the long hours, but you can’t run on little sleep forever. Make sure you factor beauty sleep into your to-do list, just as you would factor in a rest day to an exercise regime. Perpetual tiredness lowers your productivity and cognition during your waking hours, which triggers the vicious cycle of long working hours that so many of us have fallen into. If there’s one thing you do when you get home tonight, let it be to switch off the light, switch off your phone, push back your alarm, and relish an extra hour or two of sweet slumber. All it takes are good habits and smart planning to get out of the office at an earthly hour. To ensure you and your staff function are in tip-top condition at work, make the most of your day and start discovering more time for you and your family. Jobs for immediate hiring during the Bentong recruitment drive tomorrow would include administration, engineering, construction ma..